Robometricschool. - There are many robot that develop to help human in this time. It is also with robot that developed by Toyota. This robot is called Toyota Partner Robot that can play music easily now. One attraction of Toyota Partner Robot to play music is when this robot play music in Toyota base camp in Nagoya Japan. 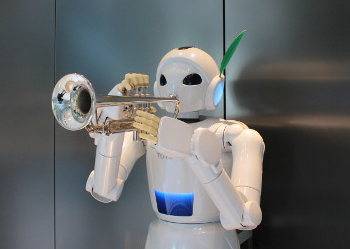 There are many visitors that interesting with Toyota Partner Robot when this robot play music in its attraction. Beside for adult people that can enjoy the base camp of Toyota that show us many modern innovation, this place also can enjoyed for many student from elementary school that also can enjoy the robot attraction to play music and other innovation from Toyota technology. As we know that Toyota motor develop robot to help their performance in his factories. Toyota want to increase quality and efficiency their product using robot technology, so Toyota has develop robot technology since 1970 year. And in 1990 Toyota develop robot with the spirit continues improvement.